The fungal wall as a clinical target in Chapter 6. The best-known chitin synthesis inhibitors are naturally occurring antibiotics which are analogues of the chitin synthase substrate, UDP-N-acetylglucosamine. They are called nikkomycin (from the bacterium Streptomyces tendae) and polyoxin (produced by Streptomyces cacaoi var. asoensis) (Fig. 8). Polyoxin is an informal name, although widely used in the literature, it is only approved by the Japanese Ministry of Agriculture, Forestry and Fisheries; whereas the name polyoxorim has been assigned by ISO (the International Organisation for Standardisation, http://www.iso.org/). Nikkomycins and polyoxins function as potent and specific competitive inhibitors of chitin synthase, competing as analogues of its normal substrate UDP-N-acetylglucosamine (also shown in Fig. 8). Zinc salts of polyoxin D (the most potent of the 13 different polyoxins which are designated A to M) are used in Japan against rice sheath blight (Pellicularia sasakii) and polyoxin B is effective in controlling powdery mildews on fruit trees and grapevines. Fig. 8. Comparison of the structures of the fungicides nikkomycin and polyoxorim (polyoxin) with (centre) the structure of UDP-N-acetylglucosamine which is the normal substrate of chitin synthase. The generic structure of polyoxorim is shown; in polyoxin B, R = CH2OH; in polyoxin D, R = COOH; and in polyoxin J, R = CH3. In the USA polyoxin D zinc salt was first registered for food use in late 2008. The US Environmental Protection Agency later expanded the tolerance exemption to include polyoxin D zinc salt residues in/on all food commodities. Different registered formulations are effective against Alternaria leaf blight and early blight, Botrytis, powdery mildew and other diseases on grapes, strawberries, cucurbits, fruiting and leafy vegetables, potatoes, citrus and numerous other crops. Both polyoxin B and D are commercially produced from fermentations of Streptomyces cacaoi var. asoensis, which was isolated from soil in Japan. Use of these agents as agrochemical fungicides has been hampered by the rapid emergence of resistant fungal strains so it is essential that they are used in rotation with other fungicides for resistance management within Integrated Pest Management (IPM) programmes. Also disappointing is that clinical treatments with nikkomycins and polyoxins have not proved effective in controlling human mycoses. This is due to limited uptake of the inhibitors into the cytoplasm of the fungal pathogen and their very rapid elimination from the host animals after intravenous administration. With care, they can be used in conjunction with other antifungal agents in clinical treatment strategies; however, antifungal agents that specifically target the chitin component of the fungal cell wall have found limited therapeutic use. Although they often greatly inhibit enzyme activity when assayed in vitro, this promise is not realised in vivo and consequently, in practice they are not effective antifungal drugs. The newest family of naturally occurring antibiotics to be developed to treat life threatening fungal infections are the echinocandins, which includes caspofungin, micafungin and anidulafungin (Boucher et al., 2004). 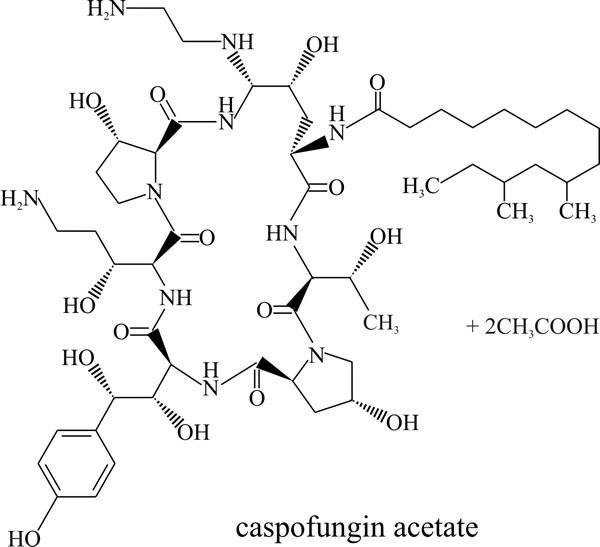 These are lipopeptide fungal secondary metabolites that feature a cyclic hexapeptide linked to a long chain fatty acid that is responsible for their antifungal activity and determines species specificity (Fig. 9). They inhibit β(1,3) glucan synthase and consequently disrupt cell wall formation and prevent fungal growth. This is a non-competitive inhibition and although the exact mechanism is not understood yet, echinocandins are known to bind to the glucan synthase catalytic subunit. Clinical resistance has been shown to be due to mutations that cause changes in one of two regions in the outer face of the β(1,3) glucan synthase protein that reduce drug binding sufficiently to permit chitin synthesis in the fungal cell wall. Fig. 9. The echinocandin antifungal agent known as caspofungin acetate which is used under the brand name Cancidas® worldwide. See https://bnf.nice.org.uk/drug/caspofungin.html. Cancidas® is prepared for intravenous infusion. Echinocandins were discovered during screening of natural products of fungal fermentation for activity specifically against Candida species. The first, called papulacandins, were isolated from a strain of Papularia (= Arthrinium) sphaerosperma, a marine species belonging to the Sordariales (Ascomycota), and led to the discovery of this entirely new group of broad range antifungals. Treatment of fungi with echinocandins results in swelling and lysis at areas of active cell wall synthesis and the echinocandins have emerged as a promising therapy for aspergillosis and candidiasis because of their favourable safety profiles; broad spectrum of activity; high potency; and suitability for oral administration (although caspofungin acetate (Cancidas® Fig. 9) is administered intravenously) (Boucher et al., 2004; Bowman & Free, 2006). The echinocandins are an important class of antifungal agents which are safe and effective. However, most are insoluble or poorly-soluble in aqueous solutions; this, and their chemical instability, can restrict their use. Since the introduction of caspofungin in 2001, echinocandins have become increasingly important in treating life-threatening fungal infections. In particular, they are important in treating septicaemia caused by Candida, which is responsible for 22% of such infections in American hospitals. Biafungin, also called CD101, is a promising echinocandin under development, which importantly has increased chemical stability and increased aqueous solubility. The development of a novel echinocandin which is sufficiently soluble for topical and weekly intravenous administration and exhibits prolonged stability in plasma and aqueous solutions up to 40°C is extremely encouraging (Krishnan et al., 2017).